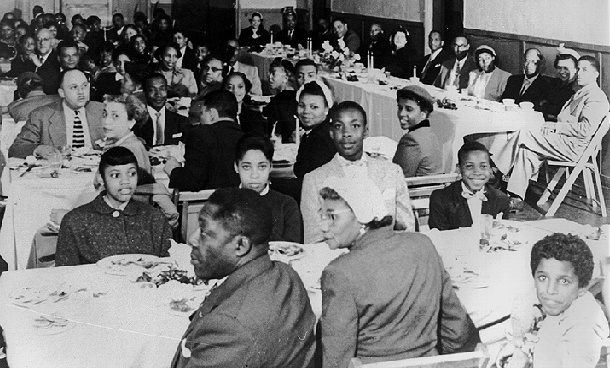 1958 Church social at Third Baptist Church in the Western Addition. The Western Addition was inhabited historically by a black population from Louisiana and Texas, which had a large portion of Catholics, unlike Bayview-Hunters Point, which was populated by people who came from Georgia, Alabama and Mississippi. In fact it wasn't until Martin Luther King came to SF that there was even a joint black religious entity in SF, the separation between Bayview-Hunter's Point and the Western Addition was that great. Hunters Point is named after the Hunter brothers, who arrived here in 1849 in hopes of developing the area. Watch to learn more on the history of this area, and watch how Bay View became a Black neighborhood. The area served America well in World War II with the Hunters Point Naval Shipyard. Nathan I. Huggins, now a Harvard historian, was one of 4846 black residents of San Francisco in 1940. He was in junior high school and remembers "how small a community we were . . . How self-satisfied everyone was, despite discrimination in almost every line of employment, pervasive restrictive covenants, and powerlessness in city politics." He also remembers "how ambivalent everyone was about the wave of blacks from the South, brought to man new jobs in the war industries. The old [black] residents saw the new as crude, rough and boisterous. They lacked the manners and sense of decorum of San Francisco." Though Huggins reports that many old-timers wished the newcomers would just go back where they came from, they stayed and formed the basis of most black neighborhoods and communities in SF and the Bay Area.